A successfully naturalized daffodil field can bloom for up to 30 or even 50 years! First, choose an area with good drainage and sunlight. An area where grass can be left unmown until the foliage has matured is ideal. Hillsides are excellent spots. The edges of woods are also good, if you are planting an early-blooming variety which will have a chance to mature before the trees come into full leaf. For best impact, plant drifts of like kinds and colours. Many gardeners "arrange" their drifts simply by taking handfuls of bulbs and throwing them about for a natural-feeling distribution -- just dig where the bulbs land! When naturalizing daffodils, you will get the best results and many years of blooms by taking the time to plant properly. For most naturalizing projects, you will be working in uncultivated soil with thick sod, so it is necessary to give each bulb a small custom-cultivated hole. Usually, this means lifting out soil with a spade. One clever way to make precise bulb holes is to use a battery-powered drill - a half-inch drill with a 3" bit usually does the job. How to plant daffodils: Select a sunny or partly sunny area of your garden. Plant daffodils in autumn a few weeks before the ground freezes. Work up the soil and plant bulbs 6" deep or 5 times their size. Add in a tablespoon of Breck's Food for Bulbs and Perennials. 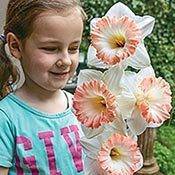 Cover daffodils with remaining soil. Add much for extra protection against a hard winter. 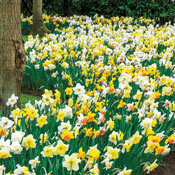 Planting daffodils in clusters of 3 or more can have a great display in the spring. 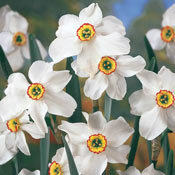 Daffodils will come back year after year for wonderful colour to your spring garden.